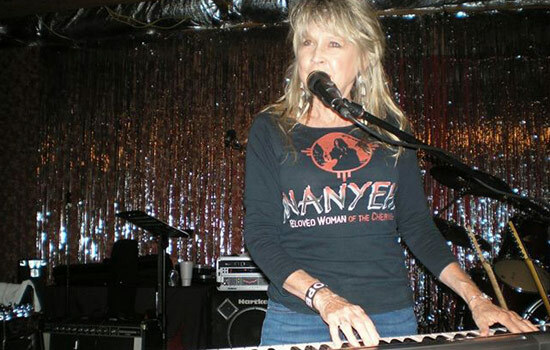 “Nanyehi-The Story of Nancy Ward” will return to The Joint at the Hard Rock Hotel and Casino Tulsa on May 4 and 5, 2018! 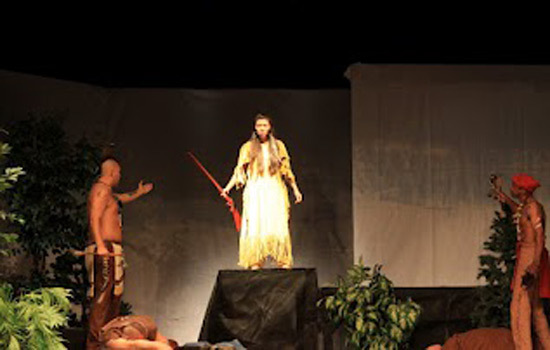 Learn more about the musical. 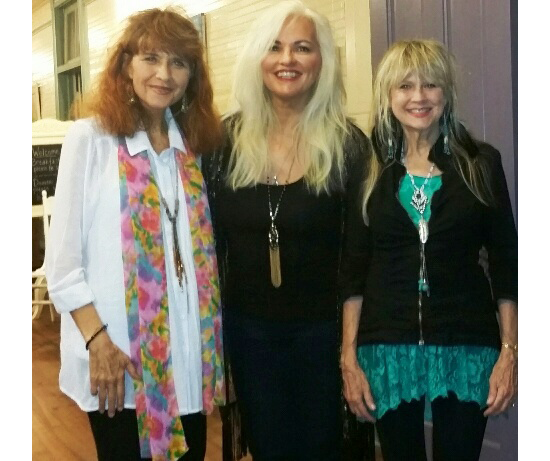 "A Cowgirl, A Diva and A Shameless Hussy" (Beckaroo, Benita Hill and Kacey Jones) at the Balsam Mountain Inn, NC July 16, 2016. 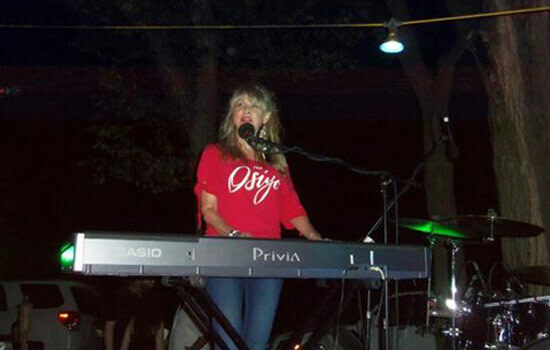 This was our last gig together. 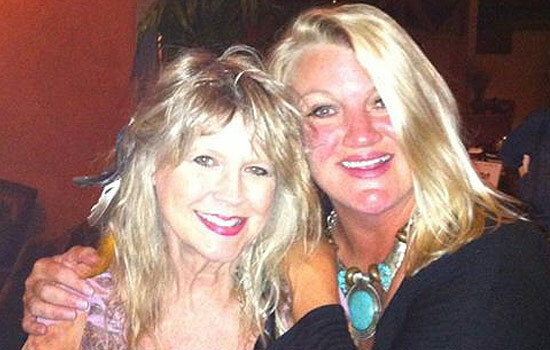 Our beloved "Hussy," Kacey Jones (on the left), was fighting cancer that night, but she ROCKED it, and had 'em rollin' in the aisles. Kacey left the planet on Sept. 1, 2016. We miss her every day. 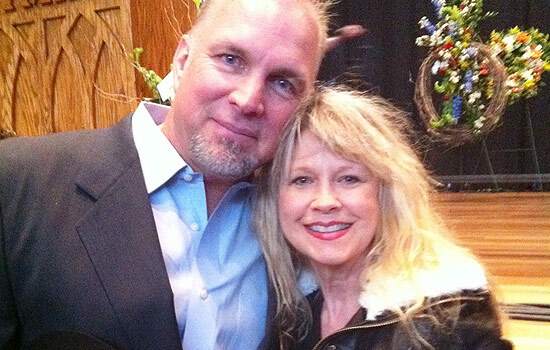 Duane and Becky celebrated their 20th wedding anniversary on May 29, 2016! 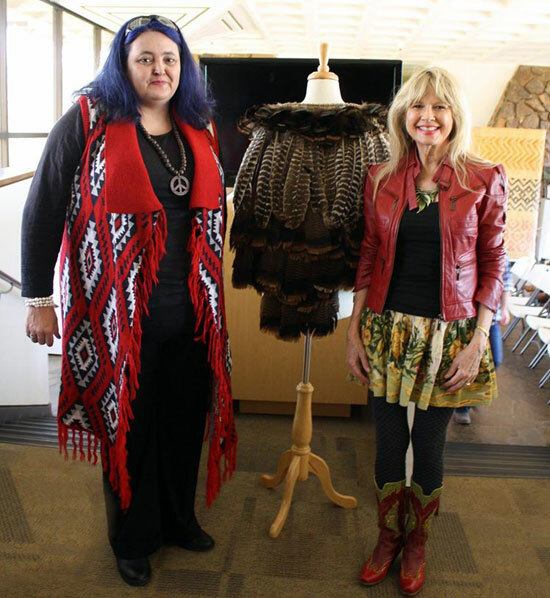 On Jan. 31, 2016, Cherokee National Treasure, Shawna Morton Cain, presented Becky with a beautiful handmade turkey feather cape to be used in future productions of “Nanyehi”! 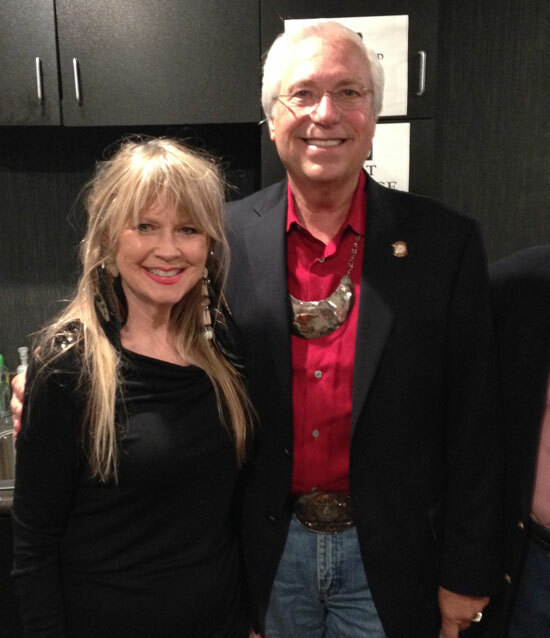 Special thanks to Cherokee Nation Councilor Shawn Crittenden for organizing the presentation of the cape. 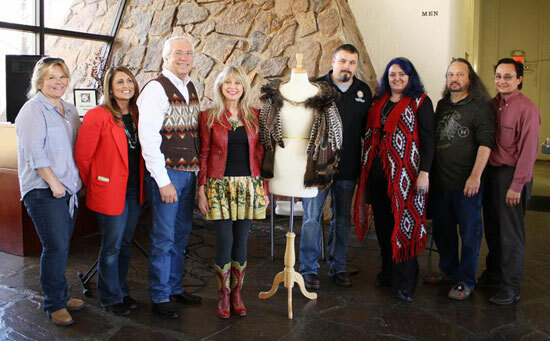 L to R: Cherokee Nation Councilor Frankie Hargis, First Lady of the Cherokee Nation Sherry Baker, Principal Chief Bill John Baker, Becky, Councilor Shawn Crittenden, National Treasure Shawna Morton Cain, National Treasure Roger Cain and Cherokee Nation Secretary of State, Chuck Hoskins, Jr.
Every year, benita Hill, kacey Jones and I (“A Cowgirl, A Diva and A Shameless Hussy”) play the Bluebird Café to benefit Alive Hospice. 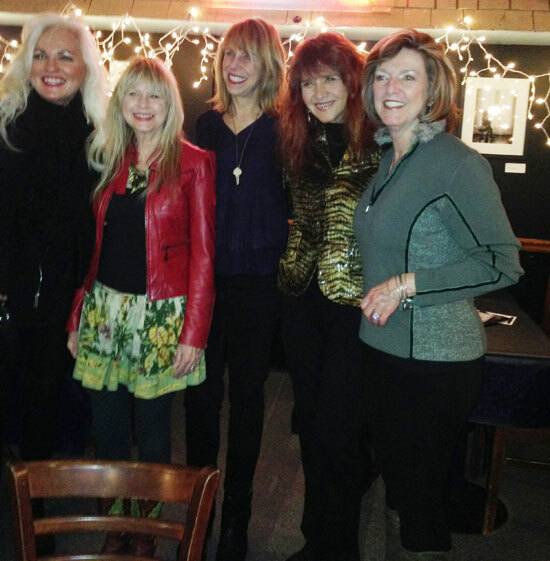 L to R: Benita, Becky, Erica Wollam Nichols, Kacey and Barbara Brennan. 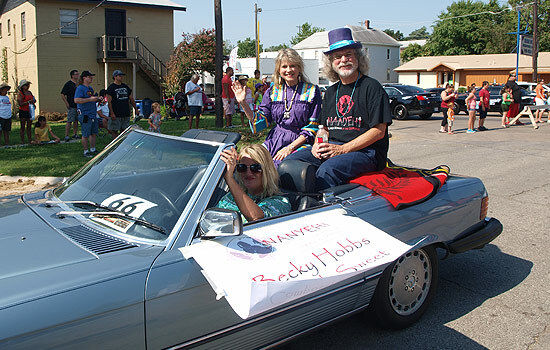 October 16, 2015 - Becky was inducted to the Oklahoma Music Hall of Fame along with Restless Heart, Tim DuBois, Scott Hendricks and Smiley Weaver. 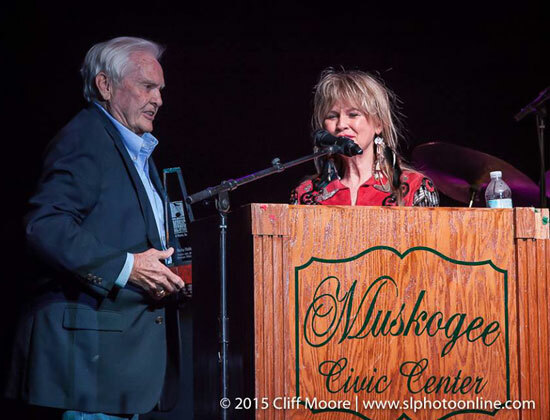 Country music radio legend and performer Billy Parker inducts Becky. 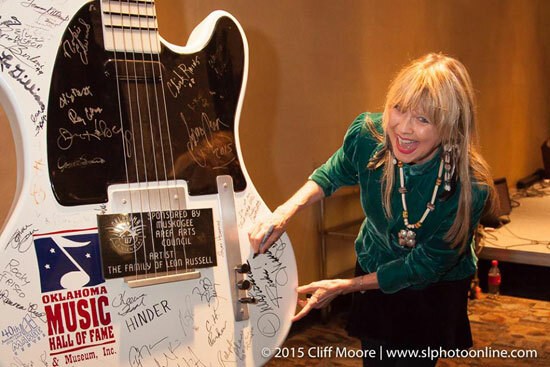 Becky adds her name to the Oklahoma Music Hall of Fame guitar. 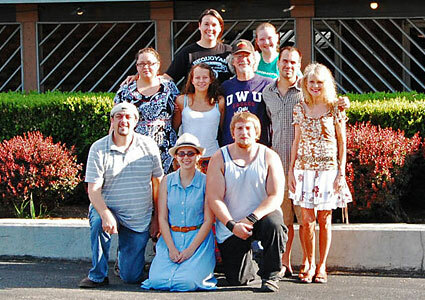 Becky's nephew Garrett Goen, wife Kathy and daughter, Ryan Leigh, with Duane and Becky. 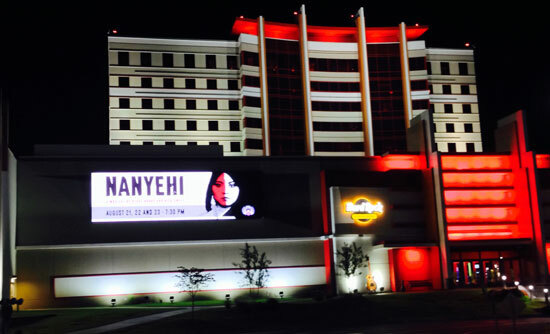 Nov. 5, 6, and 7, 2015 "Nanyehi-The Story of Nancy Ward" received three Standing O's at the Hard Rock, Tulsa, Oklahoma. 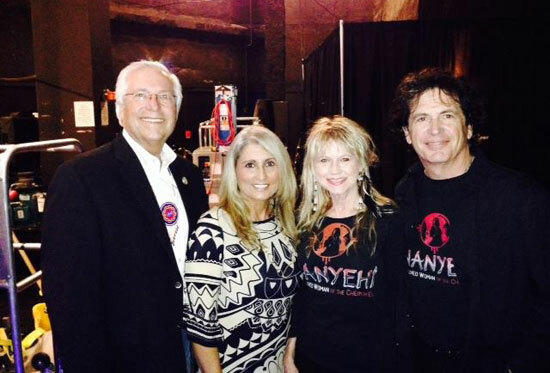 Chief Bill John Baker and his wife, Sherry, say "Osiyo" to the cast backstage before the show. 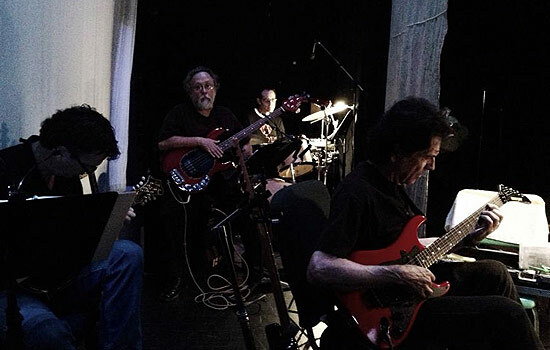 Nanyehi orchestra pit with Duane Sciacqua and Jim Paul Blair. 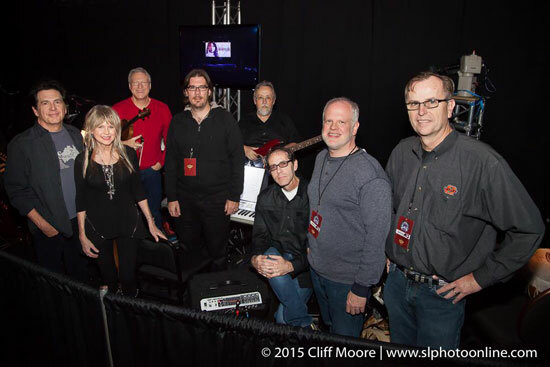 Our rockin' orchestra: L to R: Duane Sciacqua, Becky, Shelby Eicher, Farren Mayfield, Jim Loftin, Ron Boren, Jared Johnson and Jim Paul Blair. 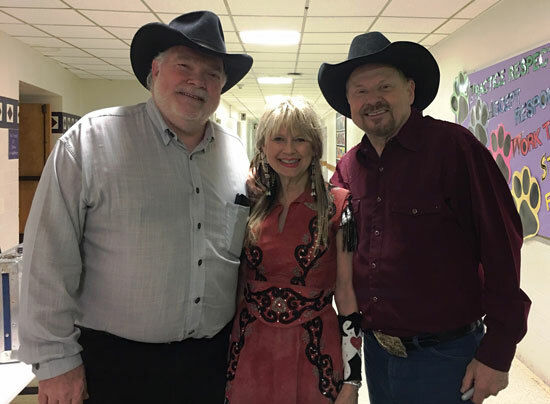 This year Becky had shows in TN, NC, KS, TX and OK, plus her performance is airing on “Country’s Family Reunion Honky Tonk” on RFD TV (check your TV listings). For updates, please click here. 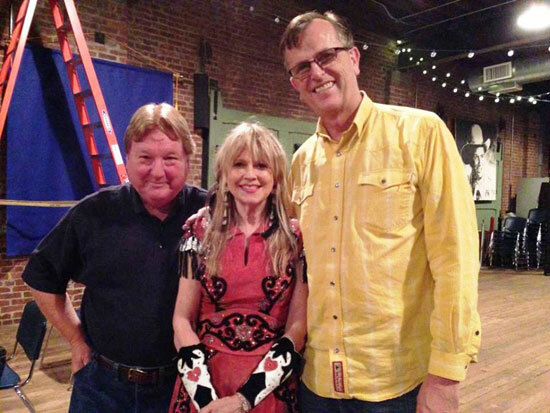 The Beckaroo performed solo at the Oklahoma Music Hall of Fame in Muskogee, OK.
L to R: Longtime friend David Webb, Becky and Jim Paul Blair, Executive Director of the Oklahoma Music Hall of Fame. 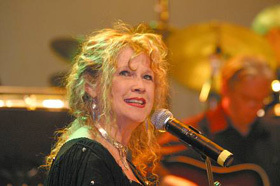 Becky performs her song “Angels Among Us” (co-written with Don Goodman and recorded by ALABAMA). Randy Owen says that this song has garnered more fan mail than any other song ALABAMA has ever recorded. 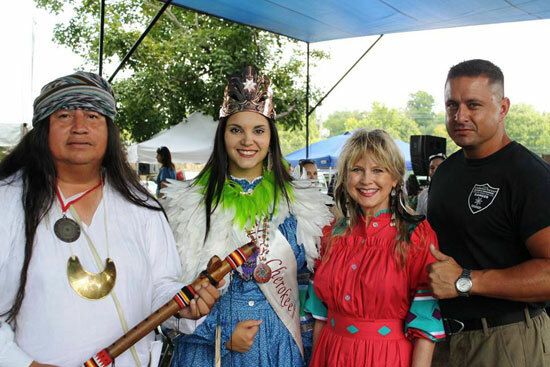 Becky sang “Tsa La Gi-We Are Many” at the 2014 Cherokee National Holiday in Tahlequah, OK.
L to R: Tommy Wildcat, Susan Plumb “Miss Cherokee,” Becky and David Comingdeer. 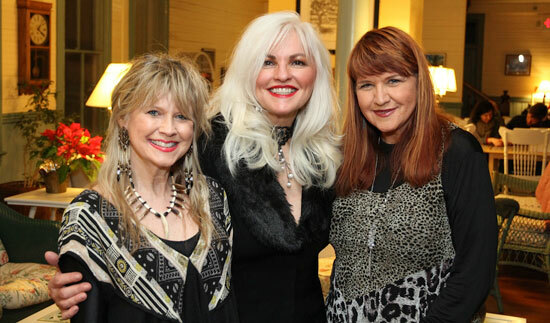 The Beckaroo enjoys doing shows with gal pals, Benita Hill and Kacey Jones, billed as “A Cowgirl, A Diva and A Shameless Hussy.” The three trade off doing songs that they’ve each written, and sing harmony with each other. 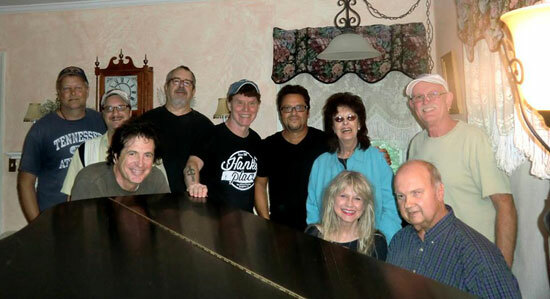 At the Balsam Mountain Inn, one of our favorite annual gigs. 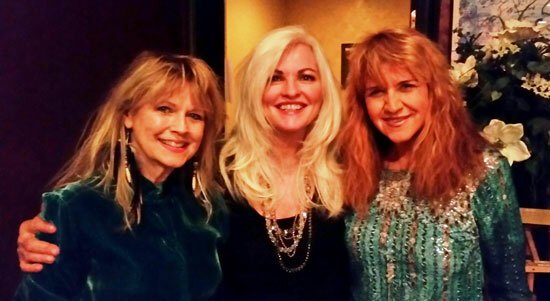 L to R: Becky, Benita and Kacey. 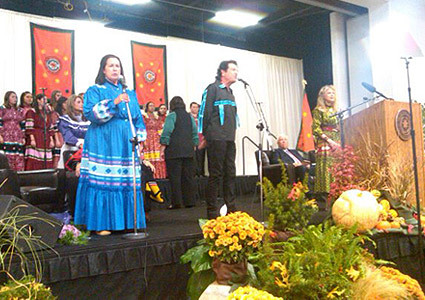 Nov. 2014 At the Frank Brown International Song Festival, Gulf Shores, FL. Check out our facebook page here. 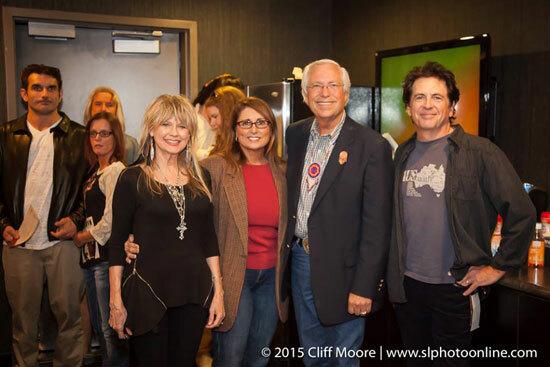 Backstage at the Joint, Hard Rock Hotel & Casino, Tulsa, before “Nanyehi.” L to R: Chief Bill John Baker, his wife, Sherry, Becky and Duane Sciacqua. 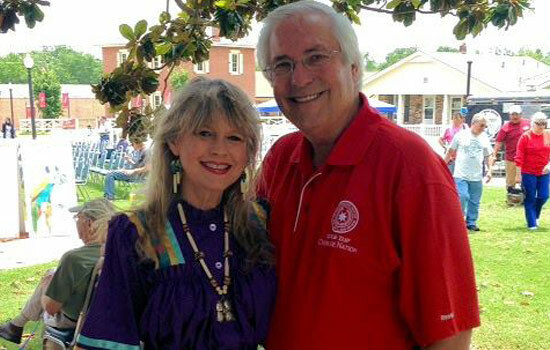 Chief Baker is a fellow Nancy Ward descendant. 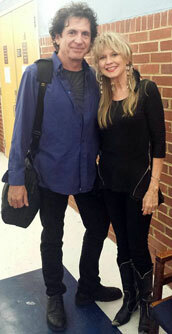 Becky and Duane after the last show in Kingsport, TN. Watch a short 10 min. 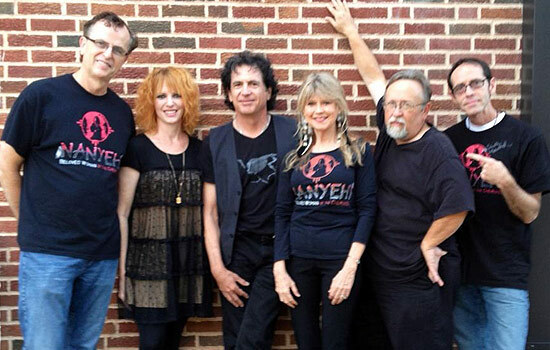 "in the making" video of "Nanyehi" and our Oklahoma premiere. 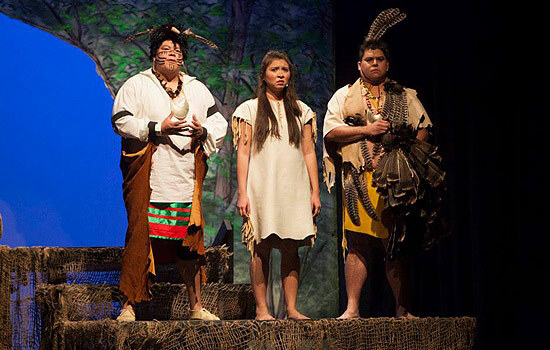 Click here to read the full NewsOn6.com article of the "Musical Premiere At Cherokee National Holiday In Tahlequah". 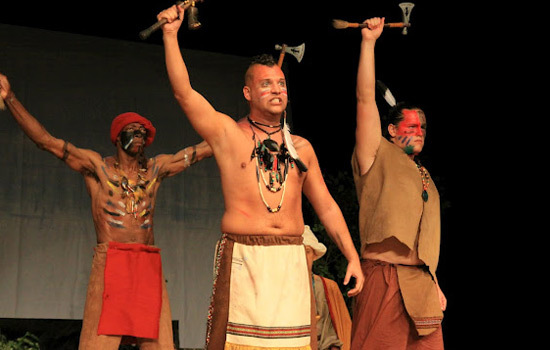 "Becky Hobbs's and Nick Sweet's interpretive story of Nanyehi is a world-class musical production. 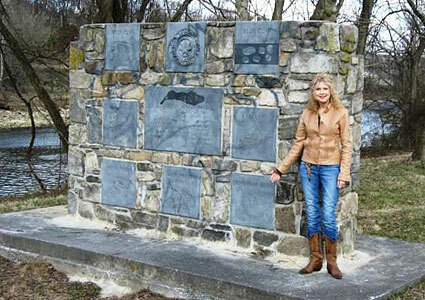 As one of her descendants, the story of Nancy Ward is both inspirational and deeply personal to me. 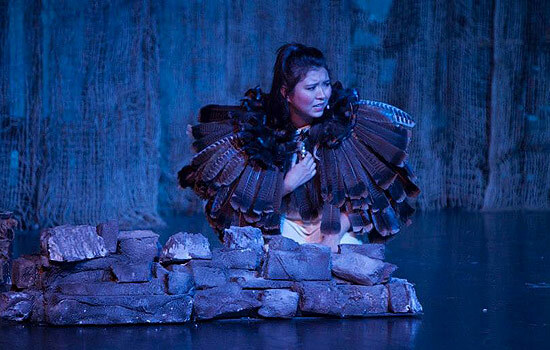 The stirring compositions, riveting dialogue and modern choreography make this a must-see piece of musical theater. 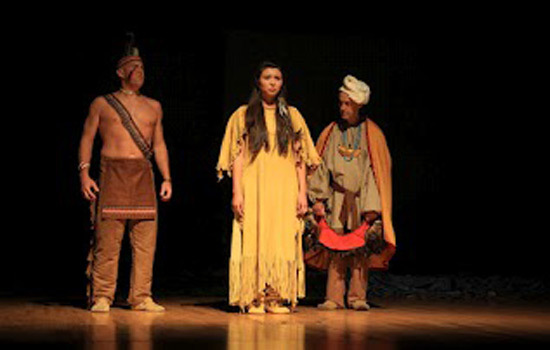 Cherokee Nation history enthusiasts and theater fans will be mesmerized with Becky's wonderful creation." 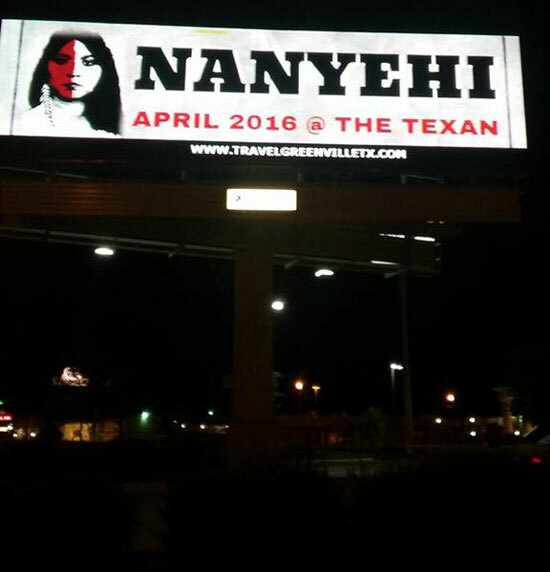 "NANYEHI is a powerful, sweeping saga told in achingly personal terms. 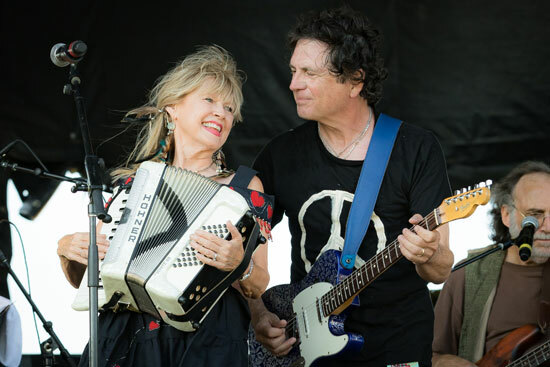 Nashville performer and songwriter Becky Hobbs has long been able to turn a phrase and evoke an emotion with the best of her peers; collaborating here with veteran stage director Nick Sweet, her songs propel a real-world story that reverberates with wisdom. 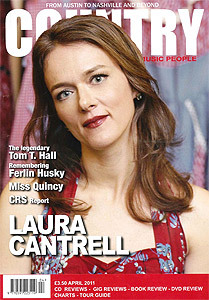 feeling, and shared humanity." 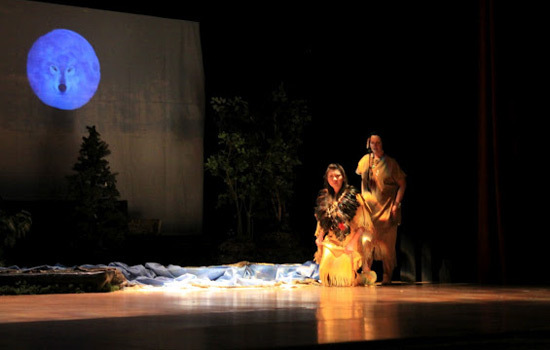 Here are some pics from our Tahlequah production of "Nanyehi-Beloved Woman of the Cherokee. 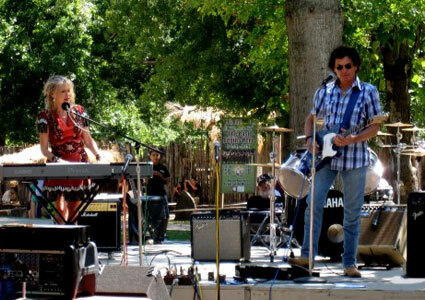 We had a great band! 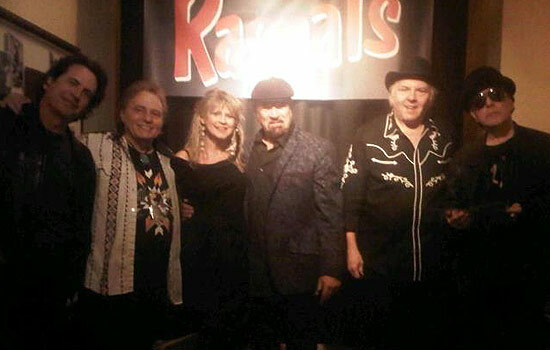 From left: Jim Paul Blair, Holly Stocks, Duane Sciacqua, me, Jim Loftin and Ron Boren. 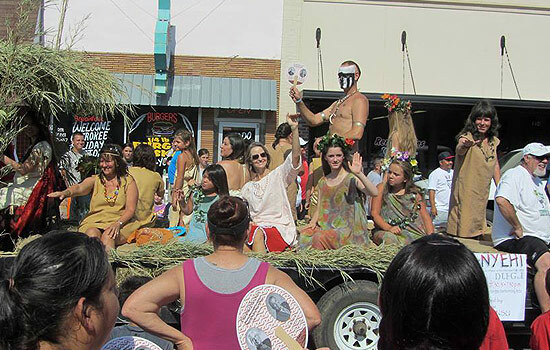 Becky, Nick and members of the cast appeared in the Cherokee National Holiday Parade. 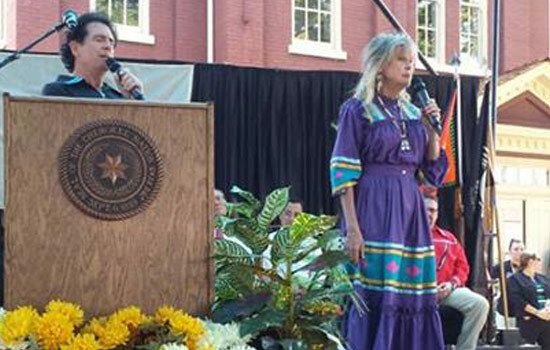 Becky and Duane sang TSA LA GI-WE ARE MANY at the State of the Nation address on Aug. 31st. 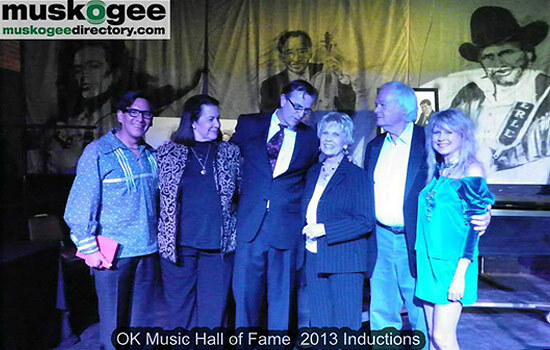 Oct. 14, 2013 - The Beckaroo got to be a presenter at the 2013 Oklahoma Music Hall of Fame Induction ceremony in Muskogee. 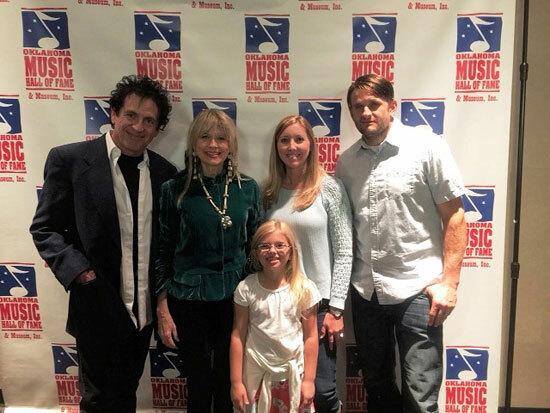 From left: Timothy Long; Inductee Barbara McAlister, Jim Paul Blair (Executive Director of the OMHOF), Inductee Pretty Miss Norma Jean, Inductee Mason Williams and Becky Hobbs. 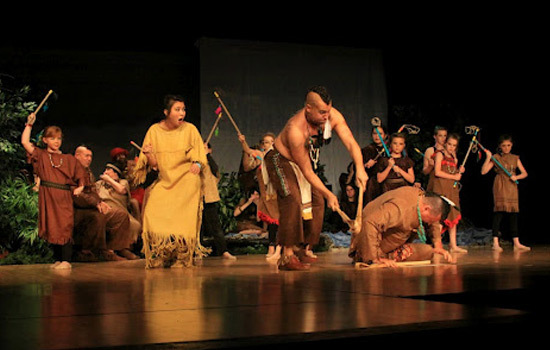 Dragging Canoe and his warriors warn the greedy settlers that "There Will Be Blood"
Nanyehi questions the meaning of life in "Pale Moon"
"What an incredible production!!!! 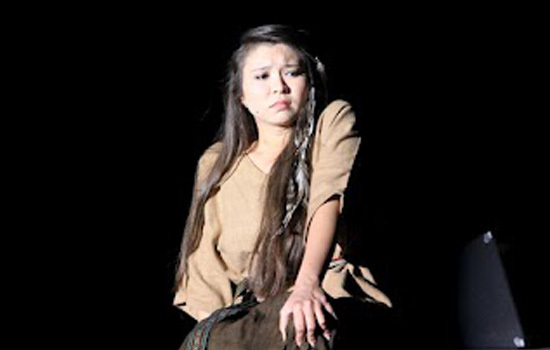 I've been reviewing shows for more than 40 years and this is one of the greatest and grandest and most emotionally heart wrenching musicals I have ever seen. 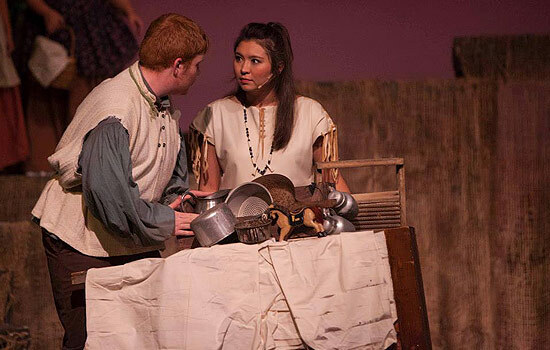 My immediate reaction is that it combines the rebellious and youthful nature of Hair with the western pioneer spirit of Oklahoma! 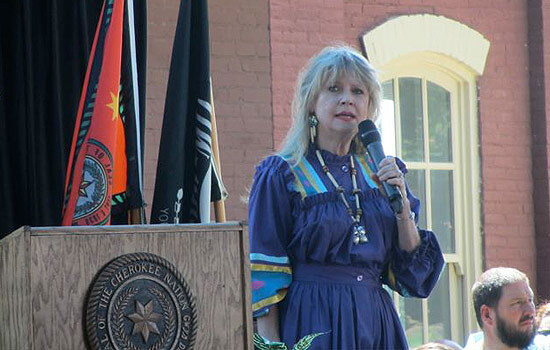 The story of the great Cherokee warrior woman and peace advocate Nanyehi (also known by her English married name of Nancy Ward) is so typical of the many Americans who are trying to get beyond what divides us while trying to remember what best unites us. 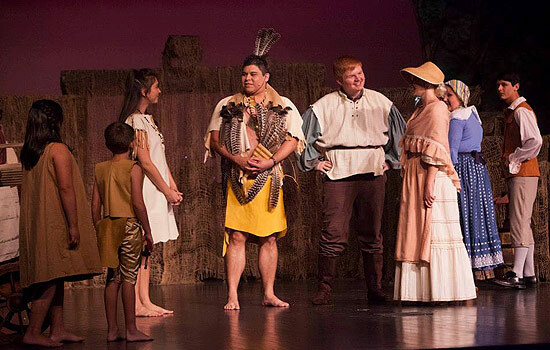 The superbly crafted songs of Becky Hobbs, great dialog by co-playwright Nick Sweet and amazing performance by Michelle Honaker in the title role brings to mind one simple question: Why isn't this show on Broadway where all Americans can be proud of the real-life role that Native Americans had in bringing about our wonderful nation?" 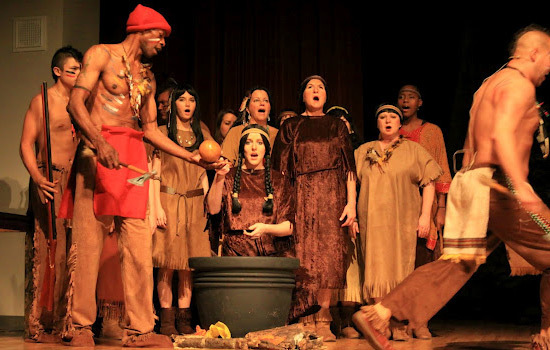 "Since Nanyehi became famous before written historical records on Native Americans are extensive, we know just enough about her life to interweave historical events with artistic license. 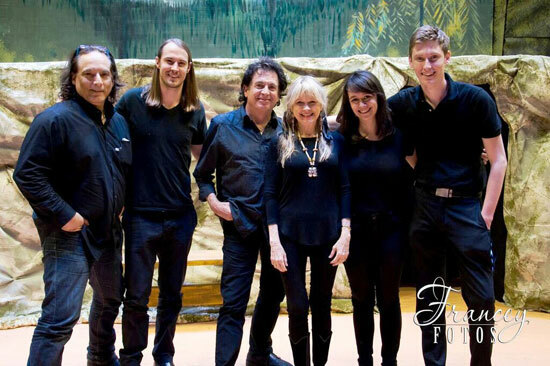 Nick Sweet and Becky Hobbs have done this to perfection to produce a spectacular musical. 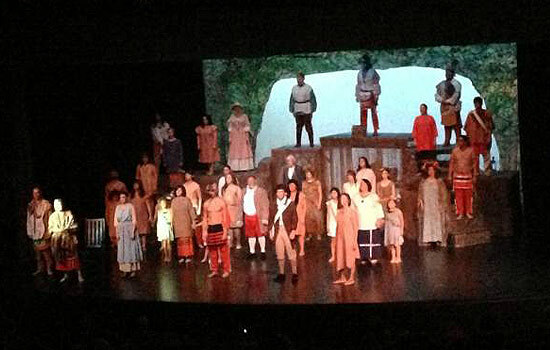 Even though I had been following the project since its beginnings, seeing the premiere of "NANYEHI – Beloved Woman of the Cherokee" on April 14 in Hartwell, Georgia, was both breathtaking and moving. The Overture, which was new to me, was so overpowering, that I was literally in tears before one actor stepped onto the stage. 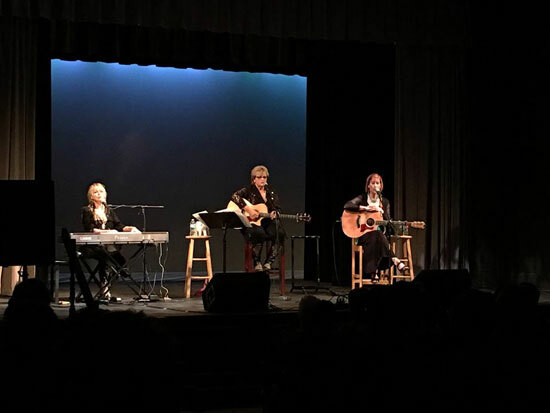 The songs, which I had heard Becky sing many times, took on a new meaning when being performed as part of the narrative of Nancy Ward's life. 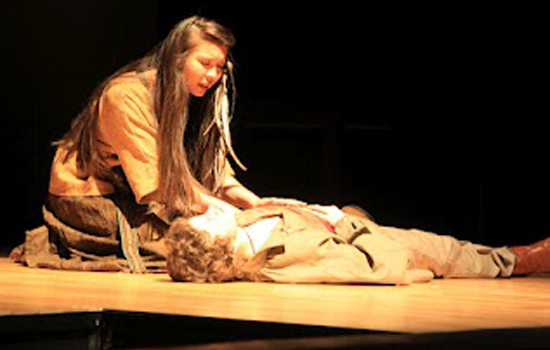 Michelle Honaker's portrayal of Nanyehi was more inspiring and spiritually moving than I would have imagined possible. I can envision Michelle taking this to Broadway and the movie screen. 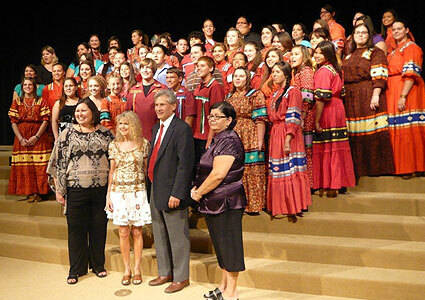 The descendants of Nancy Ward will be proud and inspired by this project taken on by Becky and Nick." 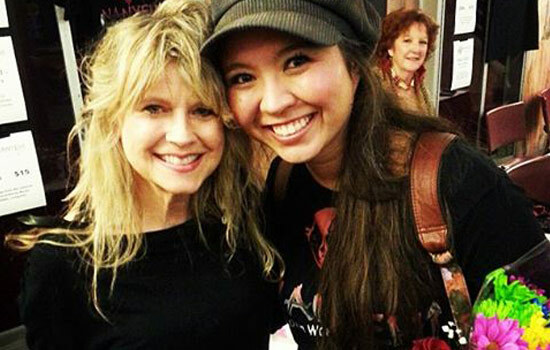 "Becky Hobbs and Nick Sweet have created a powerful, unique, and brilliant musical about Nanyehi/Nancy Ward. 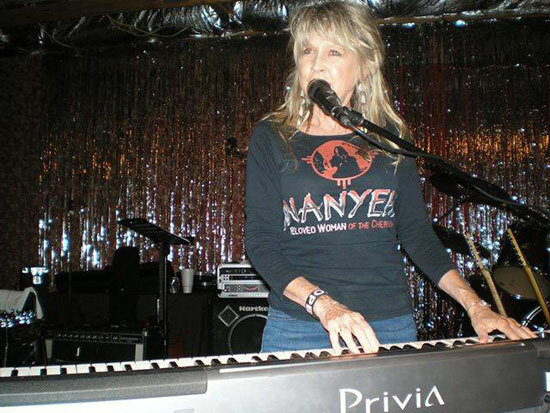 The songs touch the heart and soul, and linger in the mind. 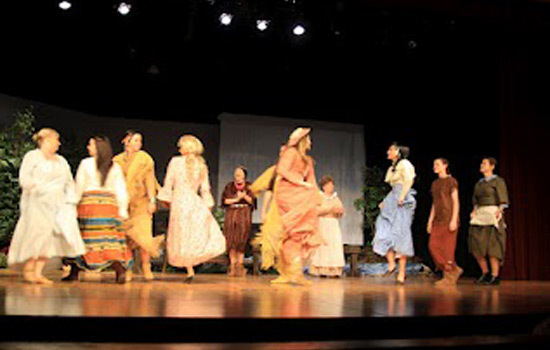 The cast, dances, costumes, story, settings, and music were outstanding. 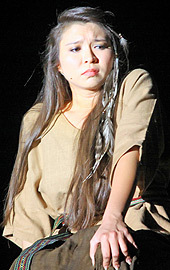 Michelle Honaker portrayed Nanyehi to perfection with her vocal and acting skills. 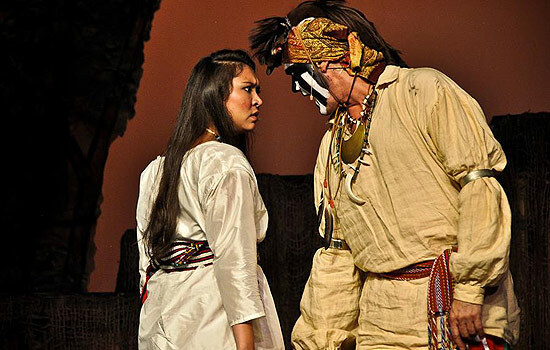 This is a shinning jewel of a musical, sure to land on Broadway and to tour the country for years, thanks to the talents of those involved who helped bring the Beloved Woman of the Cherokee to life. 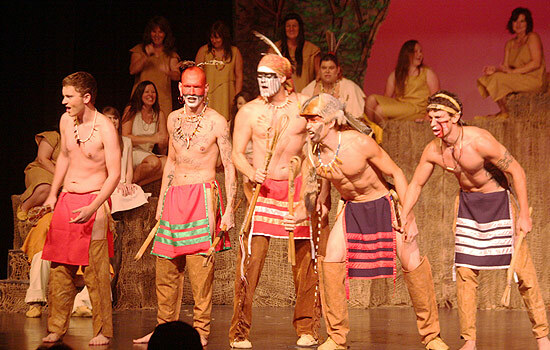 Standing ovations for every performance were well-deserved. I can hardly wait to see it again. 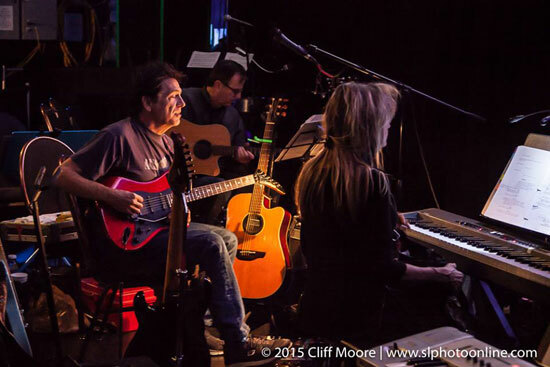 I am certain that both the musical and the song "Pale Moon" will be multi-award winners." Janelle Taylor - Multi-award winning, New York Times bestselling author of numerous Native American novels, including Destiny Mine and the "Lakota Skies Series." 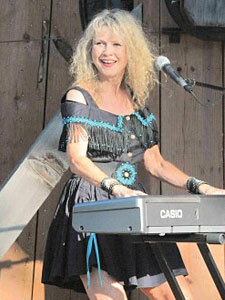 "Michelle Honaker has set her sights high and achieved a great accomplishment. 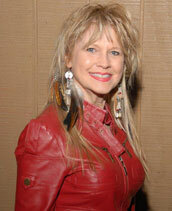 She epitomizes the spirit of peace for which Nancy Ward is known... 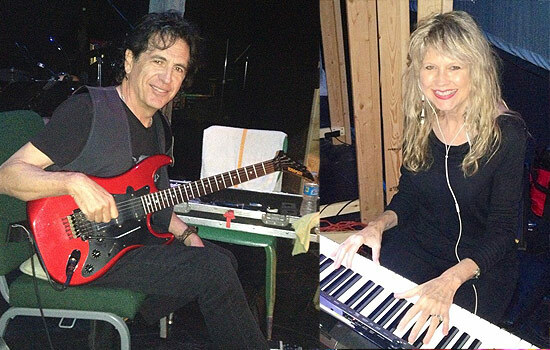 I enjoyed the musical greatly and plan to return later this month for a repeat performance." 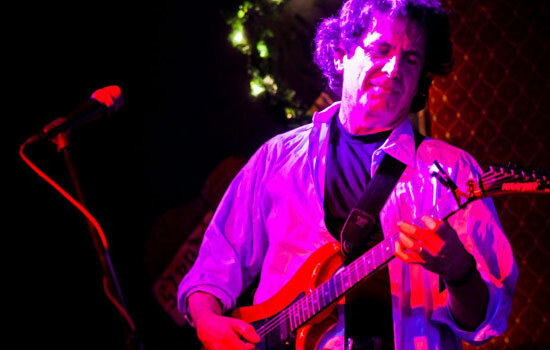 Danny Peary's in-depth interview with the Beckaroo has now been updated! 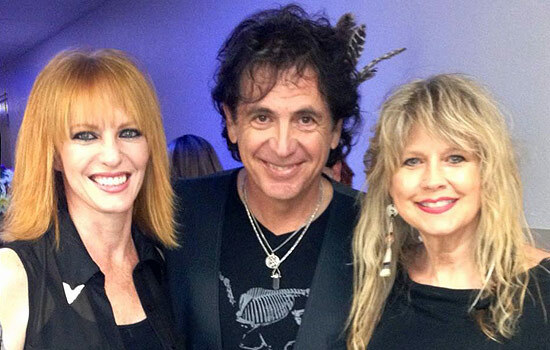 "A Cowgirl, A Diva and A Shameless Hussy". 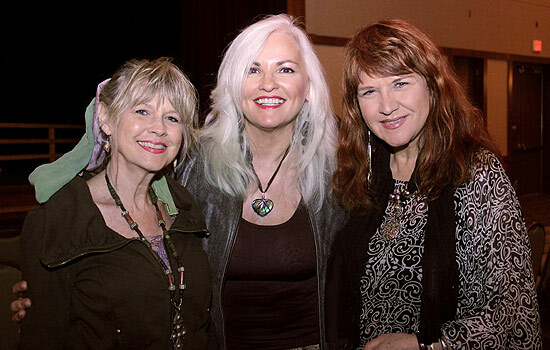 Becky Hobbs, Benita Hill and Kacey Jones perform together, featuring songs they've each written, harmony vocals, humor, and inspiration. 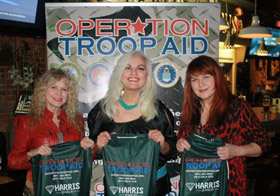 Photo taken at the Whippoorwill in Gallatin, TN for Operation Troop Aid. 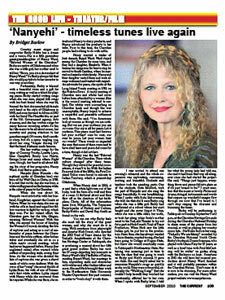 NANYEHI and Becky Hobbs have a full-page article in the September issue of THE CURRENT magazine, page 105. 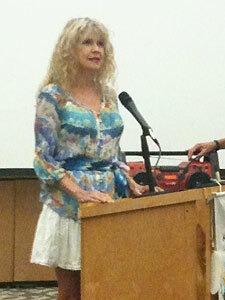 Writer Bridget Barlow attended one of the workshops at NSU and interviewed several of the participating students, as well as Becky and Nick. The Current is widely read in NE Oklahoma, and NW Arkansas. 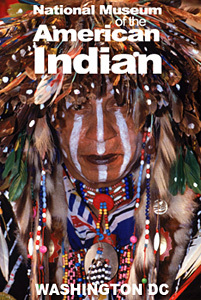 NANYEHI-BELOVED WOMAN OF THE CHEROKEE is one of eight recipients of the 2010 Visual and Expressive Arts Program Awards of the Smithsonian's National Museum of the American Indian. 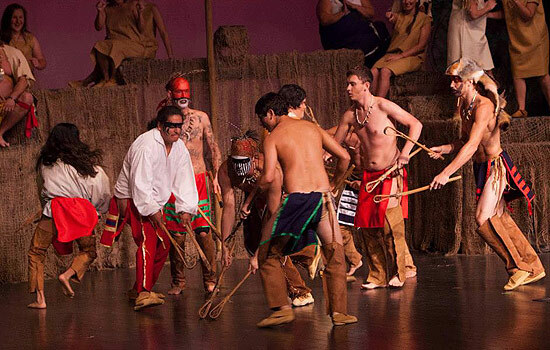 The museum's award program offers support to a wide range of arts activities with the goal of increasing knowledge, understanding and appreciation of contemporary Native American arts. 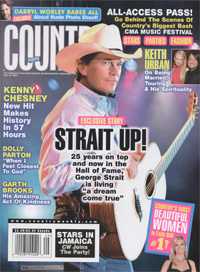 The July 16, 2007 issue of Country Weekly features the Beckaroo! 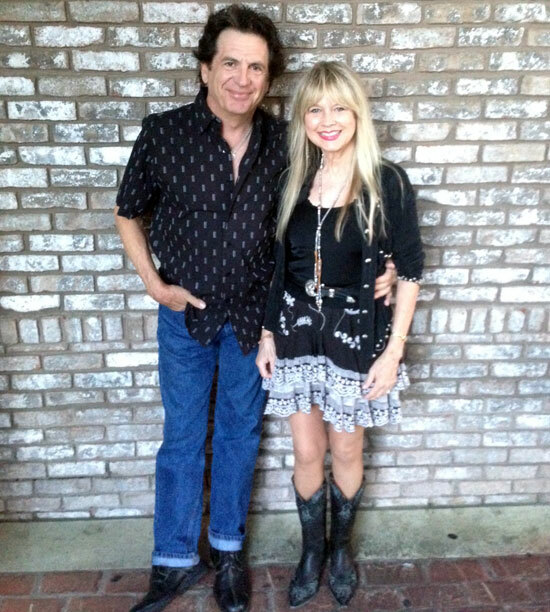 Beckaroo & Duane visited Becky's old high school friend, Hans Schmoldt and his lovely wife, Kathy, in Grand Junction, CO when Duane was playing Country Jam with Rodney Atkins. 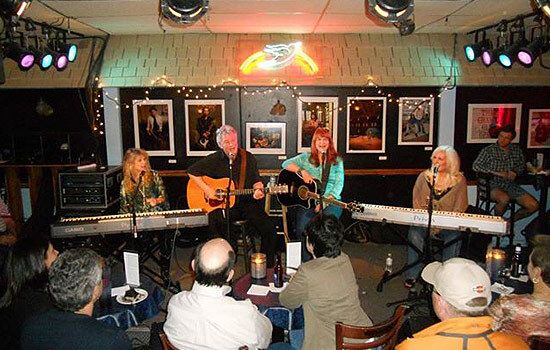 Rodney has had three #1's in a row, and each stayed at #1 for multiple weeks. 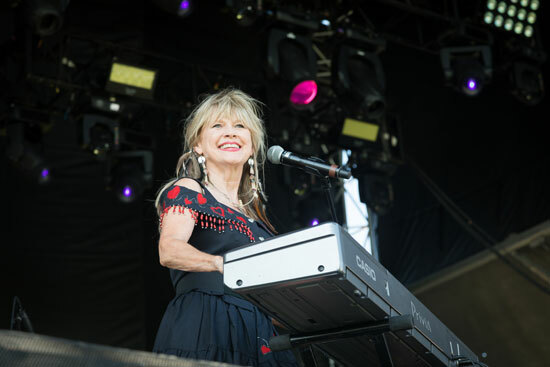 It was a great concert (30,000 people) and Hans & Kathy rolled out the red carpet, with 2 fun-filled days of rafting down the Colorado, drinking in sky chairs looking out at the beautiful western skies, shooting bottles with a slingshot, and a catered dinner under the Colorado stars with fantastic pianist, Roy Hutchins entertaining. 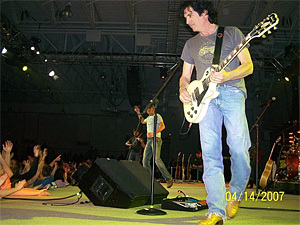 Duane rockin' with Rodney... taken from the "These Are My people" video shoot.